One of the most difficult configuration challenges for MikroTik equipment seems to be switching and VLANs in the CRS series. Admittedly, the revamp of VLAN configuration for MikroTik CRS switches in early 2018 made things a lot easier. But, sometimes there is still confusion on how to configure VLANs and IP addresses in VLANs with MikroTik RouterOS operating on a switch. This will only cover VLAN configuration for CRS 3xx series switches in RouterOS as SwitchOS is not nearly as common in operational deployments. CRS 1xx/2xx series use an older style of configuration and seem to be on the way out so I’m not 100% sure whether or not i’ll write a similar guide on that series. If you’ve been in networking for a while, you probably started with learning the Cisco CLI. Therefore, it is helpful to compare the commands if you want to implement a network with a MikroTik and Cisco switches. While many commands have almost the exact same information, others are as close as possible. Since there isn’t always an exact match, sometimes you may have to run two or three commands to get the information needed. In the last article, we began using EVE-NG instead of GNS3 to emulate both Cisco IOS and RouterOS so we could compare the different commands and ensure the translation was as close as possible. However in switching, we still have to use real hardware at least in the realm of MikroTik – Cisco has IOSvL2 images that can be used in EVE-NG for switching. Bridging is a very confusing topic within the realm of MikroTik equipment. It is often associated with CPU forwarding and is generally seen as something to be avoided if at all possible. 1. Within routers, bridging generally does rely on the CPU for forwarding and the throughput is limited to the size of the CPU. 2. In the previous generation of CRS configuration, bridging was not the best way to configure the switch – using the port master/slave option would trigger hardware forwarding. After MikroTik revamped the switch config for VLANs in 2018 to utilize the bridge, it more closely resembles the style of configuration for Metro Ethernet Layer 2 as well as vendors like Juniper that use the ‘bridge-domain’ style of config. It is important to realize that bridging in the CRS, when used for VLAN configuration is actually using the switch ASIC to forward traffic and not the CPU. In this instance, the bridge is merely used as a familiar configuration tool to tie ports and VLANs together but does in fact allow for the forwarding of traffic in hardware at wirespeed. This command will create a tagged or “trunk” switch port on VLAN 200. Additional VLANs can be tagged on a port by using the same syntax and adding a new VLAN number. This command will set the bridge loop prevention protocol to Multiple Spanning Tree. As a general observation, MSTP tends to be the most compatible across vendors as some vendors like Cisco use a proprietary version of Rapid STP. This command will create a bonding interface which is similar to a Port Channel in Cisco’s switches. Two or more physical interfaces can be selected to bond together and then the 802.3ad mode is selected which is LACP. You can also select the hashing policy and ideally it should match what the device on the other end is set for to get the best distribution of traffic and avoid interoperability issues. This print command will show all learned MAC addresses in VLAN 200. This print command will show all learned MAC addresses on port Po1. 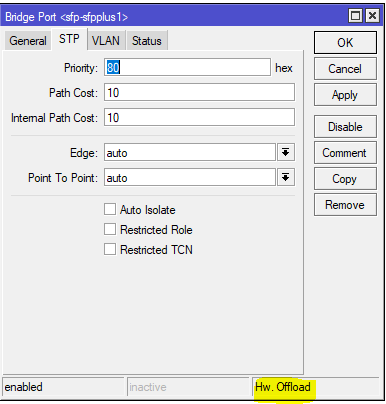 The bridge vlan print command will show all configured VLANs in the switch. This command will show the details of the LACP configuration and whether the bonding interface is running which indicates a valid LACP neighbor.